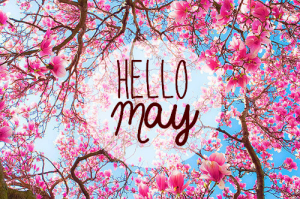 The Month of May is just about here. There are beautiful flowers in bloom and warmer weather heating up the season, preparing us for summer. But as May quickly approaches us, there is another version of the word I want us to think about. May, as in the past tense form of might, can be defined as “opportunity” or “possibility”. Such examples include ‘there may be rain’ or ‘may your future be bright’. When using may in a sentence, it suggests a chance of something happening. But in order for something to happen in life, we must take risks and know that everything works out in the appropriate time and place. However, nothing will happen if you just stay still. Just as the seasons change, time also changes our situations. This leads us to another form of May, or symbolic of being in our earliest stages of our life. Just as time goes on, life also goes on. And if we don’t take chances, opportunities could pass us by. This May I want you to be blessed and know that God has placed you right where He wants you to be. And “may” you find endless possibilities and happiness during the month, and throughout the year.